Inexpensive “chips” use a resistor to make a linear change on one input to the computer (OEM ECU) controlling your engine. A linear change is, by definition, correct under a few conditions and incorrect at thousands of others where it accomplishes little to nothing. The Unichip is a computer that makes tens of thousands or changes on multiple inputs to the OEM ECU… the correct change at all points, like only a computer can. Your engine’s ECU responds to an innumerable combination of values when making its control decisions. Inexpensive tuning options use very simple tricks to effect a linear change to just one of those values but, unfortunately, the required changes on that channel are not linear and – therefore – can’t be properly modified with a linear change. Additionally, that channel is not the only one that should be changed to make power. That means while the inexpensive tuning solution may potentially provide a “correct correction” in one small area, that same correction is “incorrect” everywhere else. The Unichip makes thousands of discrete corrections… each “correct” for the specific values being changed and the Unichip makes changes on multiple channels. Computer control – The functionality of your car’s engine is essentially identical to the engine sitting in your grandfather’s car from the 1950’s. There may be more valves per cylinder, higher compression, and there’s fuel injection in place of the earlier engine’s carburetor but the big picture is identical. Fuel is mixed with air to produce a combustible mixture, that mixture enters the combustion chamber, gets compressed, is ignited, and exits the combustion chamber… basic Otto-cycle operation which is unchanged since the mid-1800’s when Nicolas produce the first car with one in it. What has changed dramatically is how that process is controlled. Forty years ago, everything was done mechanically, hydraulically, and pneumatically; it worked pretty well but required constant attention and tweaking. Engines couldn’t be set to the limit without fear of frequent failure and everything needed to be frequently retuned. Today a computer runs the show. Depending upon the application, the ECU controls everything from basic engine operation to literally everything the engine does. To control the engine, the ECU receives feedback signals about what’s happening in the engine and send out control signals to achieve the desired operation. To generate the feedback signals, the engine is covered in sensors that report what’s currently happening to the ECU and with sensors to tell the ECU what the driver wants to happen next. A typical engine may have a dozen or more sensors each dedicated to reporting something very specific to the ECU. One sensor reports on the water temperature in the cooling system, another reports on the position of the throttle plate, another reports the composition of the exhaust gases. At any given instant, by looking at the values of each feedback signal, the ECU has a unique snap of the current condition or state within the engine. The ECU compares that current state with the commanded state being asked for by the driver and sends out the appropriate command signals. If the current state matches the commanded state, the command signals will be the same as the last set of signals since the engine is performing as desired. If the current state is different than the commanded state, the ECU makes preprogrammed changes to correct the deviation. At any given instant, there is a command state and a current state which means there is only one set of appropriate command signals the ECU will send to the engine… it’s a computer and like any computer it always responds the same way to the same set of incoming data. Changing performance. To “tune” a computer controlled engine, you have two choices… reprogramming or piggybacking. Reprogramming leaves the sensor feedback signals unchanged but changes the ECU’s response to those signals so that something other than what the OEM intended happens. Reprogramming can be accomplished either by rewriting the code in the OEM computer or removing the OEM computer and replacing it with something else. • Piggybacking leaves the programming in the ECU unchanged but changes the sensor feedback signals so that the ECU’s perception of the engine’s current state is inaccurate. Piggybacking can be accomplished by either adding a piggyback computer or by somehow altering the values on one or more of the feedback signal channels. The relative advantages and disadvantages of the various options are addressed in another Blog entry and are beyond the scope of this discussion, so the only things we’ll be looking at for the rest of the entry are using inexpensive “tuning” options vs. using a true piggyback computer. The ECU controls the engine and the ECU’s perception of the engine’s current state is entirely based upon the signals it receives from the engine and exhaust mounted sensors. In response to a specific value of whatever that sensor is monitoring, a discrete value is sent to the ECU. Depending upon what the sensor is monitoring, that value may be a discrete voltage or a discrete Hertz, but in all cases there is a unique value sent to the ECU for each state being detected by the sensor. Like any computer, the ECU operates at a particular speed known as a fetch-decode-execute (FDX) cycle during which it performs its operations. ECU FDX cycles are around 8 MHZ – 16 MHz which means the ECU completes between 8 and 16 million cycles per second. Whether the engine is idling or screaming at redline doesn’t matter, and a better FDX speed won’t make the engine run better, it’s just how often the ECU completes a cycle. For discussion purposes, let’s assume 8 MHz FDX cycle. o The ECU “fetches” the current value from every sensor it’s connected to. As already discussed, the discrete value the ECU fetches from each sensor corresponds to a very specific condition that exists in that part of the engine at that instant. – If your engine is spinning at 6,000 rpm, the ECU fetches data 1333 times per revolution or 3.7 times every degree of crankshaft rotation. – The sensors are divided into two different sets and the ECU looks at both. Feedback group – provides the ECU data on the current engine state. • Command group – provides the ECU data on the desired engine state. o The values for all of the feedback sensors are “decoded” and converted from electrical signals into digital numeric values and entered into the appropriate locations in the ECU’s algorithms and tables and the numbers are all crunched to determine the engine’s current state and the commanded state. o The ECU compares the current state and the commanded state for deviation. o ECU algorithms determine the appropriate control signals to correct calculated deviations between the current and commanded engine states. o The digital numeric values for each control signal are converted to the appropriate electrical signal. o The control electrical signals are transmitted to the engine for execution. So, your vehicle’s ECU is fetching, decoding, and executing data about 8 million times per second and at every one of those cycles, there is a unique set of feedback signals reporting what’s happening in the engine and a unique set of control signals sent out to the engine. Note that for a large number of cycles, the signals may not change… for example at 6,000 rpm the injectors are only firing 50 times per second but the ECU will send out 4 million signals during that second most of which will obviously be “don’t fire now” commands. None the less, the ECU is still generating commands all the time. Obviously, an important part of this computer control is what a particular value from a particular signal “means” to the ECU. As noted above, during the decode phase the electrical signals from the sensors are converted to digital numeric values in a process call scaling. Very literally, the signal comes is entered into an algorithm which converts it to a number. Every signal value has a corresponding unique number value for every sensor’s every value. You can see from the equation that when velocity doubles, pressure increases by four fold so when the engineers building the ECU’s scaling algorithms, they include this non-linear relationship. As an example, let’s look at a typical vehicle with a 0-5v MAF provides the airflow input to the ECU. Here are some values from that vehicle for both the feedback sensor signal and the corresponding numeric value after the ECU crunches that signal into an airflow number. You can see when the electrical circuit values roughly double, the corresponding calculated airflow changes are not only significantly higher but the while the second voltage “double” causes more than twice the numeric change than the first “double.” Makes sense since that what the formula says. As mentioned above, there are two common ways of manipulating the feedback sensor signal values to achieve a performance change. The first is using an “in-line” chip typically mounted on the MAF or MAP sensor line and the second is using a piggyback computer. While the in-line sensor is a much less expensive option, the non-linear relationship discussed above is the key to why in-line chips are limited in capability. … and given that our vehicle’s electrical system the potential is fixed, if the resistance increases current must decrease. In our tuning quest, if we can reduce the sensor output, we can make the sensor “tell” the ECU the airflow is lower than it actually is which will cause the ECU to command less fuel. The ECU believes it’s commanding the appropriate “factory” fueling, but it doesn’t have an accurate indication of the actual airflow. Since the actual airflow is unchanged, the actual mixture will become leaner which is exactly what we want because virtually all engines run overly rich in stock trim. The science is sound and the application of that science is simple… add a resistor to the MAF or MAP sensor line. This is exactly what you’re getting when you install an inline MAF recalibrator. To create an inline recalibrator, the manufacturer looks at where they want to create the “perfect” correction and determines how much they need to decrease the numeric value the ECU has calculated. Let’s assume that our test vehicle is running a 10.0 – to – 1.0 AFR which is far richer than needed to make good power. If we want to change that AFR to 13.0 – to – 1.0, we have to make a -23.1% change to the amount of fuel being used. If we can decrease the ECU’s airflow perception without changing the actual airflow, the ECU will command 23.1% less fuel and the AFR will be changed exactly the way we want. To do that, we need to look at the MAF circuit and calculate the resistance change needed to reduce the 0-5v sensor output by -23.1% at that point. If you’re clever, you should see the fly in the ointment. You have a resistor with which you can modify the voltage to trick the ECU, but you have a single fixed value you can use. Because of the nonlinear relationship between voltage and numeric equivalent values, there is no single value by which you can change the sensor output that will produce the desired change across the entire range. You really need thousands of different corrections to do it right but you only have a single value to use. That being the case, your best is to choose that point at which you want your correction to be perfect and accept that at all other points the correction is wrong. Beyond the nonlinear scaling requirement, there are some other issues which I’ve talked about in other Blog entries. The ECU commands a different AFR in Closed Loop than it does in Open Loop and when you make an inline resistor change to affect the Open Loop values, you are also inadvertently changing the Closed Loop values. The ECU sees all of those changes as errors and it builds fuel trims to correct those errors. Those fuel trims are applied, in turn, into the Open Loop fueling commands which obviously change the AFR. Additionally, when the engine is below normal operating temperature, the ECU uses very different routines; as soon as the engine warms up, those routines change but with a fixed resistance change, you’re making the same change all the time. Finally, the ECU responds to ambient changes in air temperature and pressure by changing its commands but, once again, you’re only able to make a constant change regardless of what the ECU is trying to do. Bottom line, under a relatively small set of conditions, an inline MAF recalibrator can make the correct change to make good power, but under all other conditions it’s making the same change which is simply wrong. Changing the sensor outputs isn’t fundamentally flawed and is based on a great concept. The problem is trying to use too simple of a device to effect the change. At Unichip, we use a powerful digital computer to analyze multiple sensor signals and make very precise changes to those signals at very specific points. While the MAF recalibrator makes a single change to the MAF sensor signal at all engine speeds and airflow values, the Unichip makes over 92,000 discrete changes to that same signal. At the point where the perfect change is -23.1%, that’s the change we make, but if the required change is -42.8% at another point, we make a -42.8% change at that point. And at the point where a +10.2% change is required, we can do that as well. 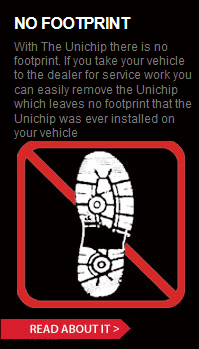 As a computer, the Unichip also has the capability to monitor multiple sensor signals and correctly respond as the ambient environmental conditions change as well as when the engine is under temperature. Not only can we detect when different changes are appropriate, we can also make those different changes. MAF recalibrators only address one of the two variables in the combustion chamber which is AFR. Besides changing AFR with far more precision, the Unichip additionally addresses the other combustion chamber variable… ignition timing. We have the capability to make the same sort of changes with ignition timing that we do with AFR. You get what you pay for. In the end, the old adage is true. Modern engine management systems are far too sophisticated to be tricked by a simple, fixed changed. Can you use a resistor to make a change, yes but at best you’ll achieve very limited results. While a MAF recalibrator is based on sound science, it’s simply inadequate to make the nonlinear changes that are needed to do that job. While a computer costs more than a resistor, you have to have an adequate tool to do the job and a resistor is not an adequate tool.